Lee Ufan (Korean, b. 1936) is a philosopher and minimalist sculptor and painter, trained and educated in Japan. Having studied modern Western philosophy in the 1950s at Nihon University, Lee became a prominent member of the avant-garde Mono-ha group, beginning in the late 1960s. The art of this artist, who has long been based in Japan, is rooted in an Eastern appreciation of the nature of materials and also in modern European phenomenology. The origin of Mono-ha may be found in Lee‘s article "Sonzai to mu wo koete Sekine Nobuo ron (Beyond Being and Nothingness - A Thesis on Sekine Nobuo." The Mono-ha artists aimed to deviate from typical Western artistic practices of media manipulation, and instead juxtaposed objects and materials in such a way as to draw attention to the relationship between things and surroundings. Lee’s paintings are frequently characterized by simple, abstract brushstrokes in dark blue and gray tones, applied to white canvases or surfaces. His sculptures, such as his prolific Relatumseries, often portray a similarly antithetical relationship by placing round or flat natural stones alongside rectangular plates of iron and steel. In keeping with his background in philosophy, Lee strives to engage viewers in contemplating the interaction between space, objects, and themselves. From 1973 until 2007, Lee served as a professor at Tama Art University in Tokyo. His work is part of the permanent collection at the Hiroshima City Museum of Contemporary Art, and has been the subject of numerous solo exhibitions, including shows at New York’s Pace Wildenstein and the Solomon R. Guggenheim Museum. Lee Ufan currently lives and works in Kamakura, Japan, and in Paris, France. 2014, Lee was the seventh guest artist selected for the contemporary art program of the Palace of Versailles. 2011, Lee Ufan: Marking Infinity was exhibited at the Solomon R. Guggenheim Museum in New York City, organized by curator Alexandra Munroe, with over 90 works, from the 1960s to the present. 2011 Solomon R. Guggenheim Museum, New York, USA. 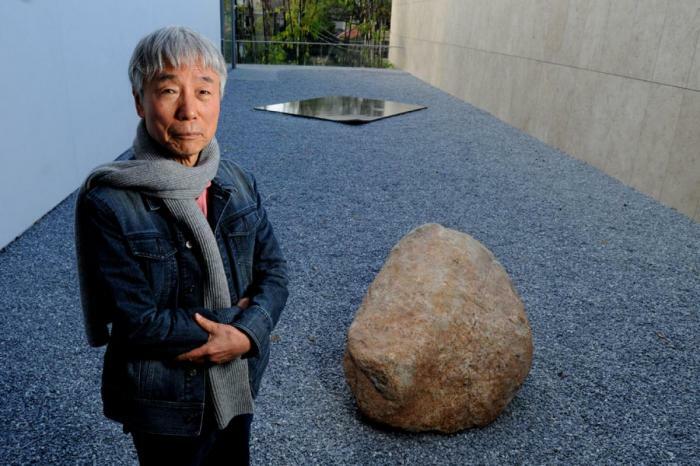 2006, The Situation Kunst (für Max Imdahl), a museum associated with Ruhr University Bochum in Germany, opened with a gallery devoted to a permanent installation of Lee Ufan's paintings and a garden of his sculpture. 2005 Major exhibitions of Lee's painting and sculpture were later held at the Yokohama Museum of Art. 2005 the Musée d'art Moderne Saint-Etienne in France. 2001 the Kunstmuseum Bonn held a major retrospective of his work. 1992 Tate Liverpool exhibition, "Working With Nature: Traditional Thought in Contemporary Art from Korea”, the first major survey of Korean art shown in Britain. 1978 Kunsthalle, Düsseldorf, Germany. Also in Louisiana Museum of Modern Art, Humlebæk, Denmark.